What really are Bad Lucky? Isinyama, Ibhadi (Misfortune) Isinyama, Ibhadi (off luck) Isinyama, Ibhadi (luck below par) Isinyama, Ibhadi (Tough luck). Isinyama goes with bad omen, bad things befall, and all the problems occur, they choose you the most. Isinyama is being in circumstances where your life brings all the bad things, where bad things befall upon you. Many people those who don’t believe isinyama is there will tell you that, it is no problem with bad things occurring to you, one thing after the other a millimeter apart, it is happening with someone elsewhere. But why you amongst them, why are you not amongst those whom their things are going well and they are Lucky. (It is because you have Isinyama / bad luck and you need cleansing). Do you know that some people are saving very harsh prison sentence of the cases which are not of their doings because of bad luck. Isinyama / Ibhadi / Bad luck comes in too many different forms; it all depends on how the bad luck spell caster sent it to deal with you. Isinyama, Ibhadi (Bad luck) does not have kindness, it treasures in seeing you having bad things happening to you, accusations and negative happenings are the work of isinyama in a human body that portrays Isinyama. For instance; they will say in Zulu “Lentombi ayiganwa inesinyama esibi” which means ‘This lady is not getting someone to marry, if she meets someone it always end up ugly, she has a hell of a bad luck’. He has not pursued his sporting carrier, every time things seem to be opening up; he fractures his leg, and have to spend all his time in hospital, this have happened several times to him; he has got Isinyama / bad luck’. ‘This man is long he has been sitting with his degrees, he can’t get a job, he applies but they take people who have got lower grades and experience than he is; he has a hell of a bad luck. This one has bad luck, all the time he is queuing for a job, they just ask him his names and takes the guy behind him instead’. Who can have Isinyama, Ibhadi (Bad luck)? Bad luck does not choose whether you are poor or rich, it may squeeze itself in your rich status and take you with surprises whilst you think that Isinyama (Bad luck) is the thing of the poor. It may also attack you as poor as you are it is never sympathetic, Isinyama / Bad luck has never allowed itself to be a victim of sympathy. Are you a man, a woman, a boy, a girl any age or any gender, Isinyama doesn’t care it will attack you just the way it has been sent to. Don’t fool yourself Isinyama does not choose a race, a creed or some people with specific backgrounds; it just strikes as it has been designed, set and sent. There are two deadly types of Isinyama that I have known from my experience of work as a traditional healer, inyanga, a spiritualist, spirit medium and a sangoma; Isinyama samanzi amnyama nesinyama egazini. Isinyama sa manzamnyama causes a lot of bad things to happen to you whereas isinyama egazini makes people feel negative about you and want to distance themselves from you. Isinyama egazini relates to Isichitho sothuvi where people have that negativity about you as if they are looking at the toilet or human waste itself. Many people use this one a lot to create breakup and divorce spells, when sent to somebody specifically for isinyama around love affairs, it makes a partner feel very irritated and negative towards his / her partner. You come across misfortunes now and then; you become the champion of bad things and happenings in your life. You are always saddened by bad and ugly occurring and you can’t pass and be passed by dangers and problems, they are permanently yours. If you were a chicken and the eagle has to catch one, you would be the noted and picked one for its meal of the day, if it drops you accidentally or by mistake, you will be the noted one for the second round it comes, why you; because you have got Isinyama (the bad luck). Isinyama samanzi amnyama. Isinyama samanzi amnyama comes when bad luck has been attached with your guiding spirits or your own ancestor spirits that look after you. Spirits sometime needs the help of we people as humans when in return we need their help. There are people whom when they are fighting with you, they mess your spiritual guides first by attaching them to isinyama that they have sent to you. That makes isinyama works perfectly making the hell out of your life, remember that your spirit guides are permanent in you, so now that the evil one would have by some means attached Isinyama samanzi on them (The guiding spirits) isinyama samanzi becomes permanent in your life and bad things are likely to befall one after the other a millimeter apart. This is called isinyama, we say you have bad luck, Isikhwakhwalala when it is too much. Ishwa: Ishwa is a bad luck it means bad luck in Zulu language, when saying that one has bad luck, the Zulu people will say “Uneshwa”. When Isinyama samanzi is at its best really haunting and sitting on a person permanently and creating the darkest times of this particular person, is called Isikhwakhwalala. When isinyama is called Isikhwakhwalala: it is isinyama and isinyama samanzi amanyama when it has gone too far; it is isinyama at one’s darkest times when bad occurring are giving birth to one another in this same body. Isinyama can affect anyone at any given time and it affects many areas of life if it has been channeled to do so. It can affect the progress of your business, work, love life, religion, your sporting life, it makes you out of other people’s world, and they don’t just feel you for no reason bad things just happen to you for no reason; but still you have to suffer that. Isinyama, bad luck. If you compare your riches and isinyama, you won’t see it when you have it and that means that you will suffer the problems of Isinyama until you pass on this life. Some rich people have considered isinyama to be something of those who are poor, Isinyama does not recognize riches it attacks everyone the rich or the poor. You might find that you are rich but isinyama is playing around those riches of yours, you are having bad things happening to you now and then and you still call it accidentally happened, but why time and again and why you not someone else like you. You don’t want to call it isinyama necessarily because you are rich and believe that isinyama is something of the poor people, and then you will remain with your Isinyama, the bad luck. Isinyama, the bad luck sometime it feels like it has bad luck itself, many poor people if they are not doing thing right they put blame to bad luck. Even when they are too relaxed and doing nothing about their lives, if you ask them why are they so poor, they will tell you they have bad luck. They talk of a bad luck as if it is something that can be seen and touched, you can’t see bad luck, and it is only the signs that can show not isinyama as the whirlwinds or tornados. Some people fail the compliances of treating each other well in marriages and relationships and at the end of the day when divorces breakout, they blame it to isinyama. Some don’t get married and relate it to isinyama and forget their behavior disorders are isinyama other than the real isinyama (bad luck). Seeking help for removal of Isinyama, be sure isinyama is a real isinyama not your behavior. Just imagine fighting your behavior thinking you are fighting Isinyama (the war will hardily end because you are fighting you). Many people have related isinyama / bad luck with the black color, for instance the black cat, if people see the black cat, they call it bad luck. I personal don’t see anything wrong with a black cat, some very lucky people are keeping some black cats in their premises and they continue to be lucky because they are. Black is not a bad color, many people has related it to bad things necessarily because it has been dressed in by people as the sign of morning their deceased in most of the African lands. In other ways you just find this word black used interrogatorily and negatively like black listed, black magic etc, thus people have thought of it being bad. In some points you find religious people relating it to the color of Satan, leaving the people actually programmed to understand that the color black relates to isinyama and darkness. Our black animals, especially the cats; where should they walk because seeing them some people think or believe that it is bad luck. Is an African bad luck, because we are said to be black and we are called backs? 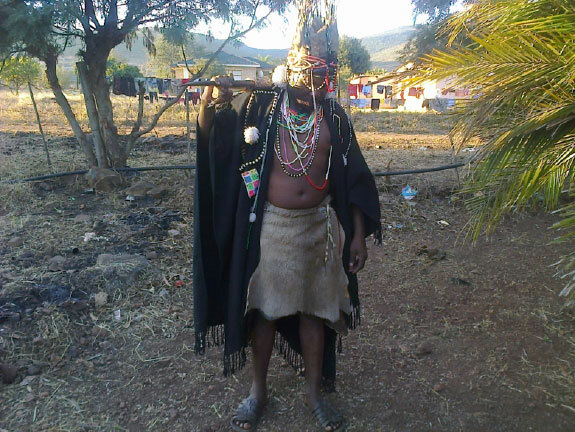 Khokhovula is wearing a black gown as his traditional outfit, some people consider this color a bad luck color, but hey; here it is dressed by a very lucky individual, Khokhovula. The Roman priests and many founders of the denominations of a Christian religion used to wear this color but amazingly today they relate it to the color of Satan. Were they once a Satan at one stage of time? I really want to know. Colors are colors please, they only help us decorate and symbolize things; myths aside please let colors be just colors. Isinyama removal needs a really expert of the likes of Khokhovula who will consider the type of Isinyama when they remove one. A person and a chancery that will just consider removing isinyama and generalize it, can’t remove it successfully. This is because one would have applied the techniques which are for the other type other than the one he is working on. This entry was posted in Love spells and tagged Badluck, Ibhadi, Ibhadi. off luck, Ishwa, Isikhwalakhala, Isinyama, Love spells, luck below par, Misfortune, Munyama, Tough luck. Bookmark the permalink. I’m James Nsizwa Ndlela having my lucky on an off that ends up my self distance from the family almost years and I only meet them when someone passed away because when I meet them the stories comes after my back how can I clean my self and see my good luck going forward amen. I have been unemployed for years I can’t finished my diploma.everything I touched turned into a mess.nginesinyama noma?